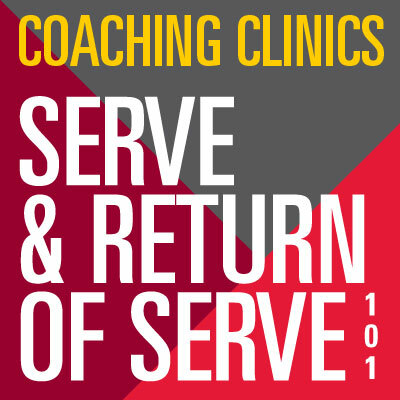 This 2-hour clinic focused solely on the serve and the return of serve. Learn everything you need to know about a executing a consistent serve and an effective return. This clinic will explain in minute detail what you need to plan to do, what to be thinking and then what to do to remove the serve and/or ROS as a disadvantage and turn it into an advantage. ​Session is capped at 4 players. Each clinic is taught by Aaron Frankcomb. Please bring water, appropriate athletic attire and any equipment. We can provide racquets and balls if necessary. The Serve and Return of Serve (ROS) are critical skills that can give you a head start in a rally or game, or immediately put you on the back foot. This clinic is focused on the strategy and approach to the serve and ROS as well as their technical execution. One of the guiding principles of Deliberate Practice is that you can't improve by doing the WRONG thing RIGHT. You need to be doing the RIGHT thing RIGHT. This clinic will explain in minute detail what steps are needed to perfect your Serve and ROS. It will help with your thought process in building up a killer Serve and ROS — turning a weakness into a weapon and creating an advantage in your overall game! Suggested for players of all standards, this session will completely change how you see the beginning of a game and how a rally is setup to be won. For social players, you will be able to have longer rallies, instead of getting frustrated by having 1 or 2 shot rallies and getting into the game. Should you serve to a left-hander's backhand? Where to go once you've "served"
Why the ROS is so "hard"